When visiting Chef Rick Bayless's garden, I was shocked to see his chickens. While, I know they exist, I had never met any urban chicken farmers. His chickens are real producers...too many eggs for his family. So, they insisted that I take a few with me. What to do with my "Golden" eggs? I really wanted to showcase the eggs and do something I'd never done before. One of my favorite dishes to order out is a Shakshuka. Recently, my brother had it when visiting Tupelo Honey in Knoxville, TN. 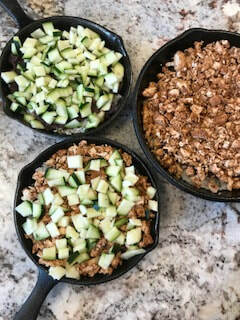 It is such a popular dish that it is claimed by most of the Middle East and Southern Europe, though, its origins are probably more North African than anything else. 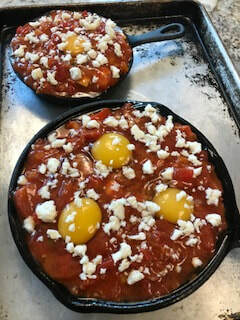 More of that food migration that I always talk about...."I might be leaving, but I'm taking my food with me"
At its base, it is a deliciously spiced tomato stew topped with lightly baked eggs. All of these juices and flavors are sopped up with some kind of bread, Challah, Pita...Recently, it has been adopted on a lot of American brunch menus, but is common to be eaten for dinner around the world. I figured this is a dish I love and I have such a great ingredient to use. To honor, Chef Bayless I would make a Mexican Shakshuka. Yes, a Mexican Shakshuka. I combined traditional Mexican flavors, poblano peppers and spices to make my chicken stew. I layered the bottom of my cast-iron with a cilantro-lime rice, which when baked turned all crispy. 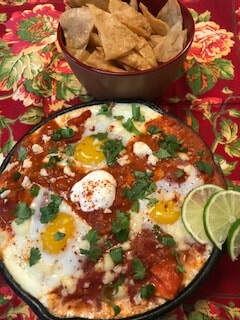 I topped it with the fresh cracked eggs, added Oaxaca cheese and baked. I made homemade tortilla chips for dipping. Finally, I topped it with cilantro, green onions, limes, sour cream, and achiote. There you have it. One of the most egg-ceptional dishes I have ever made!. Shashuka, Evanated. 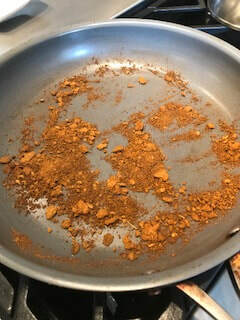 Combine Chili powder, Oregano, Cumin, and Smoked Paprika in a pan. Let the spices smoke on low heat in the pan just until they become fragrant. Add Ancho chili paste. Mix together. Add 1-2 Tbsp of water...just enough to make a thick paste. Add Chicken, coat with paste, and cook thoroughly to 165 degrees. Remove the chicken from pan and shred. Add a Tbsp of Olive Oil to the same pan. Once cooked...add garlic, tomatoes, and tomato paste. 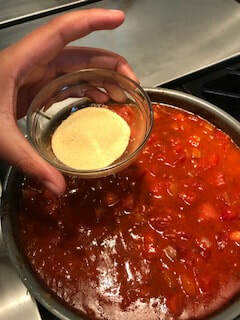 Add 1 Tbsp of Masa Harina to the tomato mixture. Add olive oil to a cast-iron pan. Layer with rice, then beans, the chicken stew. Cook in oven for 10 minutes or so, until egg sets. Garnish with crema, lime, and achiote. 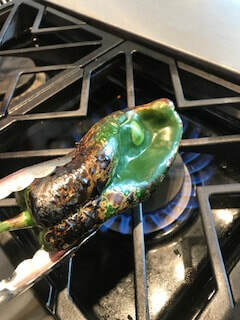 I like to roast my peppers. It gives a nice smoky flavor. 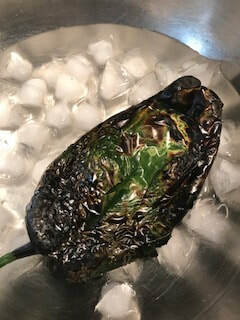 To roast them, you can throw them on over an open flame for a few minute to get a nice char, but you can place it in the oven on broil, too. Once it is charred to your liking, stick in in an ice bath and remove the skin. This is a great use for day old rice. 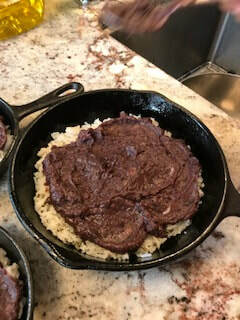 To make the rice really crispy, you can place a layer in the cast-iron and place that in the oven for about 10 min before filling with the rest. I hate the smell of garlic burning in a pan. 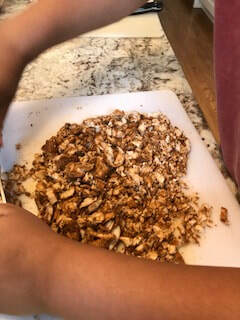 I often make a paste out of the fresh garlic (basically, chopping the garlic so finely that all that is left is a paste. I realize a video is in order to really explain, but do your best). Now, when added, the garlic is fragrant and cooks evenly. No yucky burned garlic. 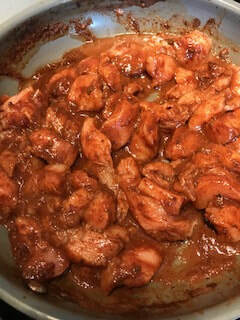 ​If you can't find achiote, you can use paprika.